First and foremost, I'm sorry that I can't update so regularly these days, and this might continue to mid Febuary. University applications is really taking up alot of my time, I've got practice for music auditions and they really aren't easy at all and on top of that prepare a portfolio for a design course. I'll still try my best to update as regularly as I can. For the time being, Diorama would be writing most of the posts. Personally, I think those silky square scarves are really nice, especially when tied around your neck. 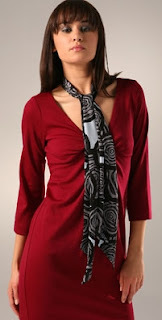 Put on a black top, and a blazer, get a scarve and tie it around your neck and you'll look absolutely stunning! I think it's an essential item that should be in your wardrobe. They look good paired with sweaters, blazers, tops, dresses and practically everything. I can't believe that I have not posted about this earlier. * I love this lady's hairstyle. What do you all think of the scarves? What are your essential wardrobe accessories? You'll never go wrong with all 3 of them. I love Scarves. I need more but once I get started its so hard to stop. My closet essential are black heels. I think that a girl can never have to many. I have the same pair in black leather and suede. People think I'm crazy but oh well. Good luck with your portfolio! Thanks, I actually really want to major in music, but I'm applying for the design as something to fall back on just in case & also to gauge my standards in graphic design. i personally love scarves.. i have prolly around 25 of them. i wish i could wear them all year long! i also love headbands! they are one of the best accessories I think, after shoes bags and sunglasses of course!!! Love it all, especially the second one at the top! I honestly only wear winter scarves (to wear out in the snow) and I don't actually have fashionable scarves. But you have made me want to try these!